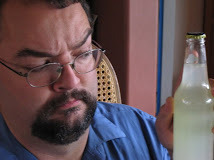 Once again, Weird Soda Review's illustrious position as the fifth most popular soda review website* has brought us to the attention of the elite bottlers of the soda world. Twice in the last few days, in fact. Two (count them, two!) 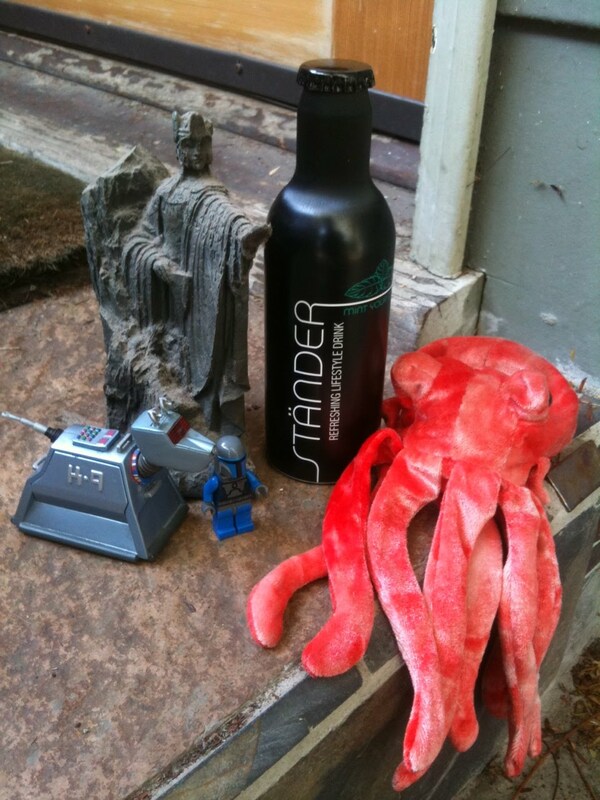 bottler have contacted the Lab, wishing to send us samples of Weirdness for evaluation. Well, who could blame them? Weird Soda Review is cool****. The first to arrive was Ständer Refreshing Lifestyle Drink. If this is a "Lifestyle Drink", then I thought it should be placed in a setting which reflects my lifestyle. I'm not sure where "lifestyle drink" lies in the beverage taxonomy. I think I'd classify this is a soda, but perhaps it is only intended for consumption as part of specific cultures or faith perspectives. What lifestyle is compatible with Ständer compatible with? It came to us (and yes, it was addressed to The Quaffmaster at the Weird Soda Review Lab) in a sizeable box. When I opened it, I found a substantial number of small black metal bottles packed in like terra-cotta soldiers in a Chinese imperial tomb. Also included were preparation suggestions (including a mixed drink known as the "One-Night Stander"), information about the ingredients (beet sugar, lemon and spearmint flavors, various B-vitamins, and caffeine (more on that later)), and helpful distribution information (if you need 67,584 bottles of Ständer, then you should order a 40 foot container). Mint sodas are not usually my favorite, and this seemed to be intended as much as a mixer for liquor as a soda, but I'd say it could be considered Weird enough for the Lab. It's carbonated, it's sweet, it's...caffeinated. Red Bull has about 80 mg of caffeine per can. A serving of espresso has about 100 mg of caffeine. An extra-strength No-Doz kind of alertness pill has about 200 mg of caffeine. This stuff is quite strongly caffeinated. Combined with the sugar, this is really closer to an energy-drink kind of beverage than a simple Weird soda. Still, we must have no fear--this, too, shall be quaffed. However, I feel that it is important to point something out here. The infamous 4Loko beverage (which caused significant problems not too long ago) was problematic because it contained a substantial dose of both alcohol and caffeine. In at least some consumers, it may be that the effects of the caffeine mask the feeling of intoxication from the alcohol, making it harder for the drinker to gauge how intoxicated he or she is becoming. While Ständer does not contain alcohol, its marketing material makes it clear that it is intended both as a stand-alone soda and as an ingredient in mixed drinks. If you drink this with alcohol, please do so cautiously, and with awareness that you may not feel as much effect from the alcohol as you normally would, but you are still intoxicated. That said, let's get on with the quaffing. I have with me in the Lab tonight the usual staff, along with Scruffynuts and Olfactorex. I am looking forward to their input on this bit of Weirdness, not least because Olfactorex's name comes from the fact that she has an impaired sense of smell. From a neurological perspective, how much this affects her perception of Ständer will be an interesting thing to assess. I've described the beverage and its ingredients to the assembled cre. LAT: "I think I'm going to bounce off the walls after this." Indeed. It's transparent, and quite bubbly in appearance. LAT: "It looks like water...that's really bubbly." Scent: Moderately strong mint, with a sweet smell of citrus. I'd call it orange rather than lemon. Nazgul: “It's hard to explain.” (NOTE: this may sound familiar to long-time followers of Nazgul's (nee Wyvern, nee(2)JAT) reviews. Taste: Sweeter than I expected. The citrus is weaker than I was anticipating, and the mint is surprisingly subtle. It's very sweet, with a background of mintiness, and the lemon is mild. Fairly pleasant, actually. This is true, the carbonation is faint, bith little of the usual acid taste (although it might easily be masked). He's right. There's a cinnamon quality to the aftertaste, delayed by around 20-30 seconds. Maybe even a bit of a bite. Interesting. That's not how I would have described it; it's as if she's picking up on the spiciness (which is quite mild) or mint, but not the citrus. Apparently, smell issues have a strong effect on this. It's actually not bad at all, a pleasant mint-citrus-fruit, milder than expected. LATER: A few minutes later, there is a very delayed aftertaste: kind of unpleasantly tart-musky. It's not overpowering, but not a lot of fun either. MUCH LATER: It's 3 am, and I am not sleepy at all. Note to self: avoid large caffeine doses. Upon much analysis and reflection, I think that--in this particular case--"Lifestyle Drink" represents an affectation more than a substantial difference from other beverages. It's a soda. The fact that it can be mixed with alcohol is not sufficient to allow it to establish a new taxonomic category of "Lifestyle Drink", except inasmuch as what sodas you consume might say something about your lifestyle. For example, I suspect consumption of large amounts of this--while it tastes good, and is pleasant to quaff--would result in my lifestyle edging closer to "insomniac". Quaff rating: The orange/lemon and mint do surprisingly well together, and this is actually quite nice. Not extremely complex or interesting, but nice. 3.0. Cough rating: Upon first consuming it, nothing really unpleasant happens. There are some odd aftertastes later (and the caffeine kick is substantial, and for me, unpleasant), but there's very little which is objectionable. 0.5. *** But it's probably about right. **** Along with bow ties, the humble fez, stetson hats, and bunk beds. We saw the hills ahead. The hills were old. The hills were rocky and tall like the mountains behind them, except not quite that tall because if they were they would have blocked our view of the mountains. A stillness sat upon the hills. Heat and grasses swayed in the afternoon sun. The road led us straight verite on to the hills. I turned to my companions, and asked if any water remained. They checked the cupholders. The road began to curve. The curves made the van lean outwards. I thought I might tell my wife about how the van leaned, but then I remembered that she had stayed home because she was sick. Sometimes people are sick. We rose higher into the hills. I began to notice the smell of sweat in the cabin, as the sun heated the air, but didn't say anything because it didn't seem right and it would make a soupcon of noise. I asked whether the air conditioning was on. They checked the console. The road wound higher into the hills. Rocks emerged from the soil of the hillside. The soil was yellow and sandy. The rocks were granite. The granite was old and hard. It stood under the sun, indifferent to the heat like the road was indifferent to the heat. The heat was hot and coming down on the rocks and the road. Places like this were sometimes hot. And rocky . I asked whether we were there yet. They checked the map. We were going to Julian. Julian was in the mountains, and this road led to it. As we reached the top of the hills, I dwelt on the thought that we were going to the mountains where Julian was. There were apples in Julian. It was famous for its apples. And its pie. I wondered if there were apples in the pie it was famous for. Why would you make pie in a place famous for apples, like Julian was, if you weren't going to make apple pie? I asked whether there was apple pie in Julian. They checked the “Welcome to Julian” booklet. After the heat and rocks we came to Julian, which was small and had a lot of trees. I thought about the heat and rocks, and noticed that there were rocks in Julian, but not as much heat. The heat was mostly in the hills. I guessed that the mountains had less heat. We were going to the wolf center, which was a place where they kept wolves. There weren't any wolves where I was from, so I guessed they were all in Julian. After the wolves, we would get pie. The pie would have apples, and it would be hot, so I thought maybe we would have to wait for the hills to eat it. We saw the wolves. They were unspeakably masculine and alone, except when there were more than one together, and I thought about being a wolf. If I were a wolf, I thought, I would be alone and sit on rocks and look at hills. I guess that's how wolves think. I was thinking about apple pie, but didn't say anything about it. Then we shivered back to the main street of Julian, which didn't have any rocks. On the way to pie, we stopped by a small store where they sold candy. I didn't want any candy, because I don't eat sweet things except pie and cake. I looked at the candy store, and slipped inside the enter-ance. Once inside, there was Weird soda. I guessed they had Weird soda along with the pie, except there wasn't any pie in this shop. I decided to check just to be sure, because sometimes you can't be sure that there's no pie unless you ask. I didn't ask, one time, and it turned out there was. I asked if they had apple pie. They checked behind the counter. I looked at her, gauging her eyes and the distance between us. She was wearing a nice shirt. I got her card and asked about which of the sodas she would recommend to someone who had just come from the hills where the rocks and heat were. She recommended the Sprecher Red Apple. She said it was her favorite. Her shirt convinced me, so I took it and two other sodas and also took her card, because I might want to come back sometime and see if there was any pie. But there probably wouldn't be, it didn't seem like the kind of place that would have pie. Then we went and had pie at a place that did have pie. I had apple pie. The apples were in Julian, as was the pie, the shop which had pie, and the shop which didn't have pie but did have Weird soda. I guess they had apple pie, instead of rocks and heat, there in Julian. We came out of the mountains and the hills, and left the rocks and heat behind as we drove back on the road. The road was curvy at first, then straight, and I thought that they must have had curvy and straight roads in Julian too. Why you would have pie and Weird soda, but not curvy and straight roads, was something I couldn't imagine. But maybe that's how they did it in Julian. Color: Surprisingly, bright red. As in scarlet. The foam leaves an an odd residue. Her angle is acute. She is also acute. Acute woman**. Scent: Whoo! Apple cider. Serious apple cider. The K-i-C says there's cherry Luden's dissolved in the apple cider. Seriously, it's a powerful smell. The apple is very strong. Taste: Sweet, cool, and strongly tasting of “green apple” candy. The first cool, apple-y taste (not very real apple—none of the tartness and slight bitter of a real apple, more like a candy apple) fades. A slight, very slight tartness lingers at the top of the mouth. The taste isn't quite as strong as the smell. Oddly, like with the other Sprecher product I've tried, there isn't as much aftertaste as after-texture—a slightly oily feel in the mouth. It's not pleasant. So we agree, it leaves an oddly physical sensation afterwards. I don't mind the taste—I even kind of like it. It's certainly quite distinctive. However, the K-i-C finds it extremely aversive. There is actual apple juice in this, as well as honey. Fascinating. That explains the strong and distinctive taste, but not the unpleasant stuff afterwards. Quaff rating: This is an interesting case. The taste is strong and interesting, if not all that good. I think the boldness deserves recognition, so I'm giving it 3.5. Cough rating: Here's where the unpleasant comes in, especially the aftertexture. 2.0. K-i-C: "I don't have to drink the rest of this, do I?" Five minutes later, I can still feel it. *2116 Main St., in Julian. Say “Hi” for me. ** Seriously, she is. Adorable. My visit to the International Food Market resulted in my acquiring several Weird sodas (as well as an additional sample of a previous review, which we will revisit soon), but I must say I have been more pleased with the Chernogolovkian sodas than I expected. The Duchess (pear flavor) and cream sodas have been enjoyable, if not life-changing, experiences with surprisingly well-crafted Weirdness. Today, we will explore the third and last of the sodas from the Russian science town, a dark concoction named "Baikal". Baikal, in a lovely artistic setting. Note the dignity. Note the balance. Note it! Note it, curse your eyes! Did you note it yet? 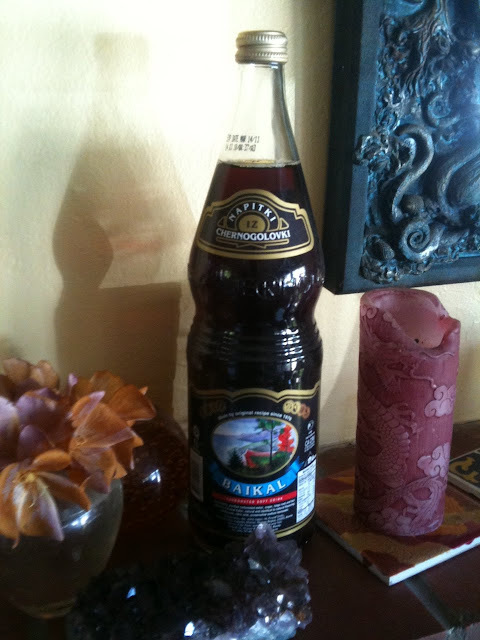 Baikal seems to be a dark brownish-red soda, not so different in color from any number of colas. It is only on further inspection that the Weirdness comes out. First, let's look at the ingredients: after carbonated water and sugar, we have "taiga root and tea extracts". Fantastic--I believe we may be able to classify this under "Plant and Weed Based Weird Sodas" in our growing taxonomy. I'm a little afraid--previous experiences with tea-based sodas have been mixed--but I don't think I've ever had taiga root. I did some looking into what Baikal might refer to. The most obvious candidate, given the lovely lakeside autumnal scene on the label, would be Lake Baikal. This is the deepest and largest freshwater lake in the world, holding--according to Wikipedia--twenty percent of the world's surface fresh water. At its deepest point, it is more than a mile deep, which for a freshwater lake is astonishing. It has its own unique native freshwater seal population. It will soon have a submerged neutrino telescope. Color: Dark brown, somewhat reddish with light shining through it. The herbal ancestry is prominent; it's somewhat reminiscent of Moxie, or Fentiman's cola. The lemon is also clear, intense but a bit distant, overwhelmed by the herbal/gingery. Nazgul: "It doesn't taste anything like it smells." LAT: "Not sour. A little tangy." Nazgul: "A little bit of chocolate." LAT: "You know...a little. Maybe." The initial taste is fairly dominated by the herbal taste, with the lemony flavor coming in from underneath. The taste is surprisingly moderate in strength, not overwhelming at all. LAT: "I really like it. Do you like it, Nazgul?" Nazgul (hissing ala Peter Jackson's nazgul): "Yeeesssssssss...."
It's lemonier than Moxie, with less of the "holy crud" strength of gentian root; whatever taiga root is, it's less off-putting. Over time, the tartness is coming out more strongly; it dominates the aftertaste, although there is a slight bitterness--a distinct third flavor--under the lemon and remaining herbal. It's not bad, just a faint, interesting taste. I think this is my least favorite of the three Chernogolovkian sodas, although it's still pretty nice. I'd happily drink it again. Quaff rating: 3.0. Surprisingly nice for a weed-flavored soda. Cough rating: 0.5. The herbal flavor might be a bit too Weird for some, although it doesn't particularly bother me. * We here at the Lab can find a way to work a Lovecraft reference into anything.